If we could all truly embrace the Biblical principle of taking just one day at a time, we would all be better off! Yes, this is a Bible principle. Jesus says in Matthew 6:34: “Therefore do not worry about tomorrow, for tomorrow will worry about itself. 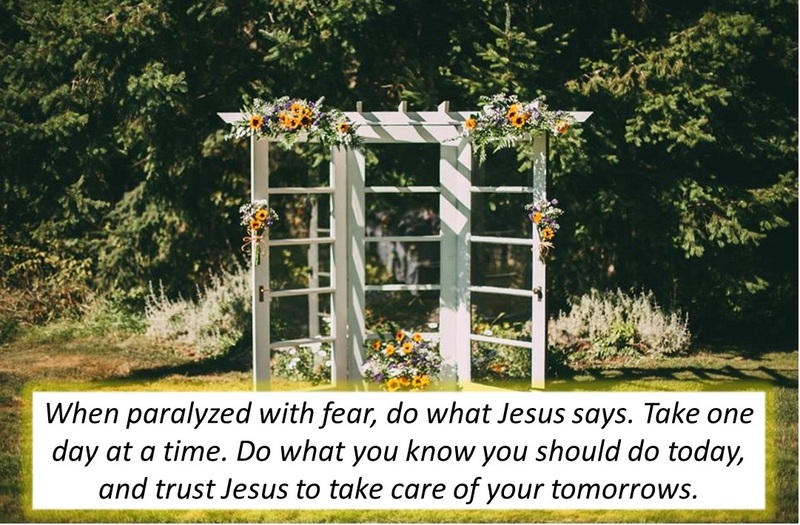 Each day has enough trouble of its own.” In other words, instead of worrying and fretting about the “what if…” questions, Jesus tells us to just focus on doing what we should do today. How does this apply to you? If it seems overwhelming to you to put your marriage back together after betrayal, just choose to move forward, one day at a time. If you tend to avoid confronting your husband or establishing boundaries on wrong behavior because you fear the possibility of future tension, trust in Jesus and move forward, one day at a time. If you don’t think you can take off the 50 pounds you’ve gained in recent years, don’t think about how hard this is going to be for the rest of your life. Just choose to eat healthy today, and take it one day at a time. Worrying about the future is pointless. Being consumed by the “what if…” questions will only keep you trapped in fear. Let’s do what Jesus says. Let’s decide each morning to do what we know we should do that day, and let’s trust God to handle tomorrow. ← Starting conversation with your hubby on date nights!